Although the Apple website not yet reflect the changes, if you enter the mobile application from the Apple Store, you will see that l iPhone 5 free price of 669 euros will leave our country. The 32GB version goes up to 769 euros and for those who demand more capacity still have the possibility to purchase the 64GB model for 869 euros. Mobile operators are still offering their rates even though some of them are opening tonight for the first clients who want to have the iPhone 5 associated with a two-year stay. If you prefer free, the Apple Store will open at 8 am for early risers. 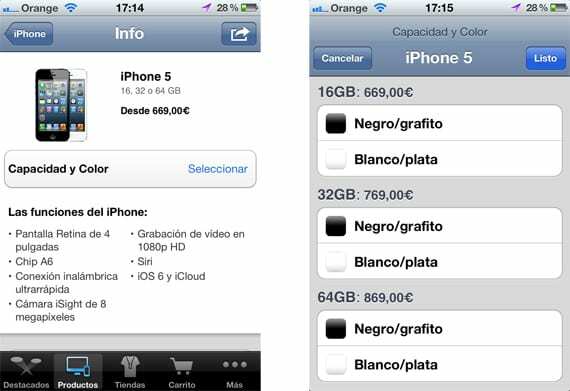 Article The iPhone 5 will cost 669 euros free in its 16GB version was originally published in News iPhone .